“Nevada just made history by granting the first-ever license for an autonomous truck to operate on public roadways. Still, don’t expect fleets of self-driving delivery vans dropping off your next pair of Cole Haan sandals from Zappos any time soon. More or less a work in progress, with only two running prototypes in existence, the Freightliner Inspiration Truck, as it’s called, is a massive – and not at all unattractive in a burly blue collar sort of way – semi-trailer truck. It was developed by engineers at Daimler Trucks North America (DTNA) to help reduce accidents, improve fuel consumption, minimize tailpipe emissions and cut highway congestion. One of only four states thus far to allow autonomous vehicles on its roads, Nevada’s Gov. Brian Sandoval affixed a license plate to the truck and took part in the ceremonial first “drive” of the truck in auto-pilot mode. Officially, it’s considered a “level 3” autonomous vehicle, meaning it enables hands-off highway driving under certain circumstances, but requires a driver to be present, ready to take the helm in an emergency or to pass other vehicles in the truck’s path (something it apparently won’t do on its own). The driver is likewise required to assume control of the vehicle when exiting the highway, driving over local roads and pulling up to the loading dock for making or taking deliveries. For the record, a “level 4″ vehicle would be designed to perform all driving functions and monitor roadway conditions for an entire trip and would include both occupied and unoccupied vehicles. 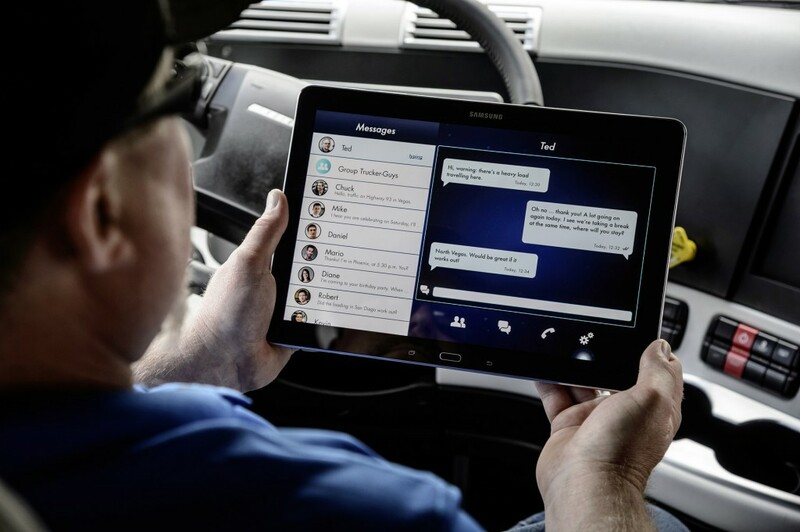 Freightliner’s system essentially leverages existing vehicle technologies, including lane stability, collision avoidance, speed control, braking, steering and assorted monitors and sensors. Similar systems are being readied for production by mainstream automakers, including Cadillac, which is planning to launch its “Super Cruise” system for the 2017 model-year, most likely in its new rear-drive flagship CT6 sedan. “Freightliner Trucks does more than any other commercial truck manufacturer to integrate the truck, the driver and the business,” says Richard Howard, DTNA’s senior vice president for sales and marketing. 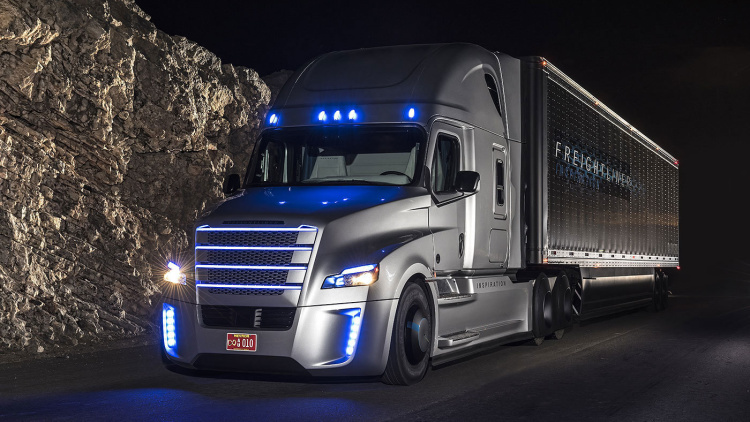 “With the Freightliner Inspiration Truck, drivers can optimize their time on the road while also handling other important logistical tasks, from scheduling to routing.” No word yet on when the Freightliner Inspiration Truck or similar model would be available to corporate fleet buyers or how much it would cost, but given that there are so few states that allow self-driving vehicles on their roads, it may take some time for commercial-grade autonomous technology to take hold on the nation’s highways”.